From 1971. LOVE the 20s inspired cloche. The sweater reminds me of my oldest sister, who was in high school in this time frame. I was pretty sure she was the coolest thing ever. She never would've worn the knickers though -- you have to be tall to carry that off. And what shoes would she have had on with this outfit? 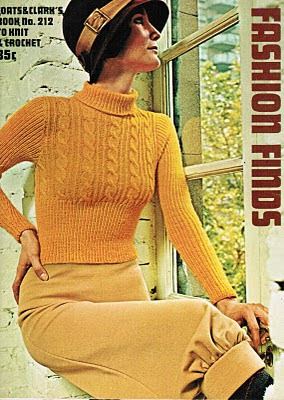 Sweater is from a knitwear pattern from Coats and Clark.